Claude Debussy, pianist and composer, was born on August 22, 1862 in St. Germain-en-Laye, France and died on March 25, 1918 in Paris, France. He is often referred to as a French Impressionist Composer with among others, Maurice Ravel (1875-1937) - borrowing the term Impressionist from the style of French painters (Monet, Manet, Degas, Renoir and Pissaro) in the last decades of the nineteenth century. Prélude à L’Après-Midi D’Un Faune (Prelude to The Afternoon of a Faun) was composed in 1892 and first performed on December 23, 1894, based on a poem by French poet Stéphane Mallarmé (1842-1898). 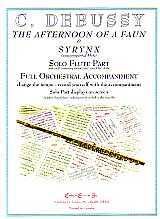 The Solo Flute part included is the Orchestra 1st Flute part. Syrynx was originally called La Flute de Pan, written as incidental music in 1913 for the play Psyché by author Gabriel Mourey (1865-1943). The Cover Story of the Fall 2008 The Flutist Quarterly (Volume XXXIV, No. 1) is an interesting article by Kirsten Jan Price about this work (Debussy’s Syrynx: Mystery, Myth and a Manuscript). Syrynx is unaccompanied - why a SmartMusic accompaniment? I originally created the SmartMusic version (you can’t really call it an accompaniment) of Syrynx to check my own accuracy in counting, remembering Marcel Moyse’s (1889-1984) statement (after a performance of Afternoon of a Faun with Debussy himself conducting) that Debussy notated works exactly the way he wanted them played. I was quite surprised to find how many variations (mistakes?) I was playing and were also being played in many recordings (most notably the missing beat of the phrase in bars 25-26, often being played exactly like the 1st bar). Since then, I have been using the SmartMusic version with students; consider it a useful starting point - which can be employed with or without the sound.